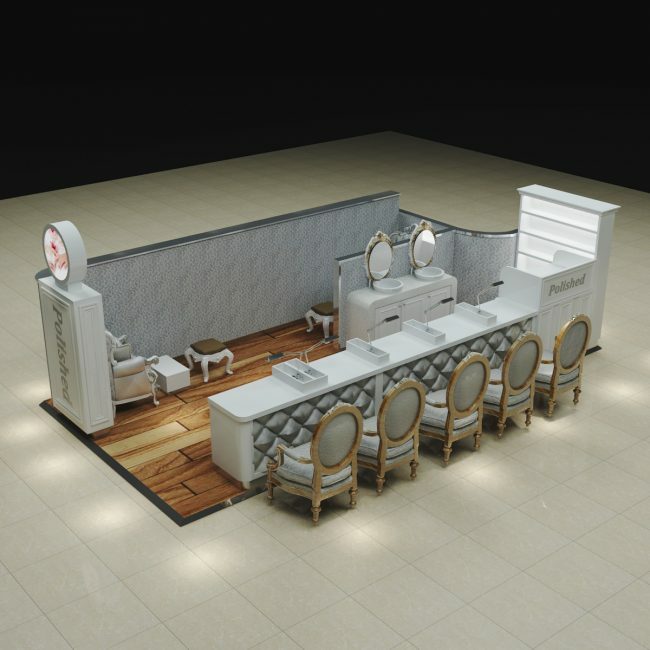 A western style nail bar kiosk, a luxury nail bar kiosk, a noble nail bar kiosk, everyone, welcome to our website, we all know, many people all like become more beautiful, especially women, so they begin to nail, nail business become more and more popular, are you in the nail business? 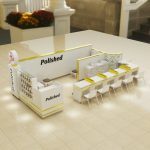 if yes, do you need a fashionable nail bar kiosk to make your business better? 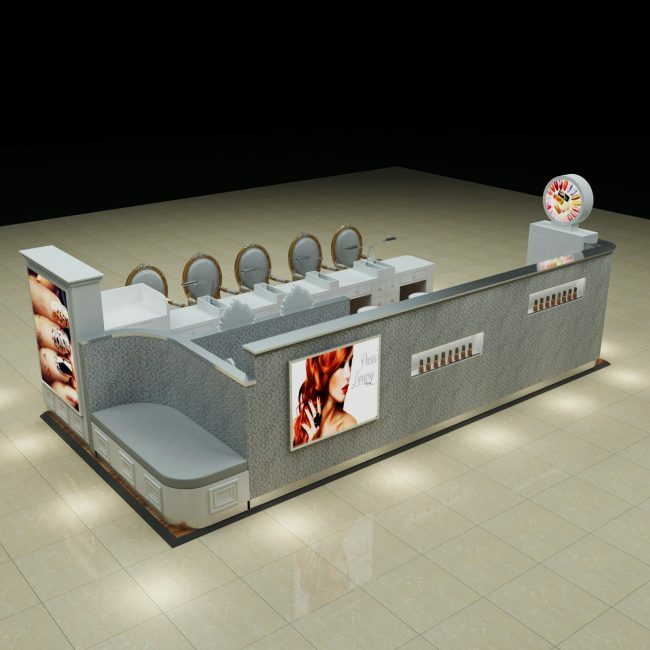 I think I can provide you a attractive nail bar kiosk, now let me to show you its beautiful images. 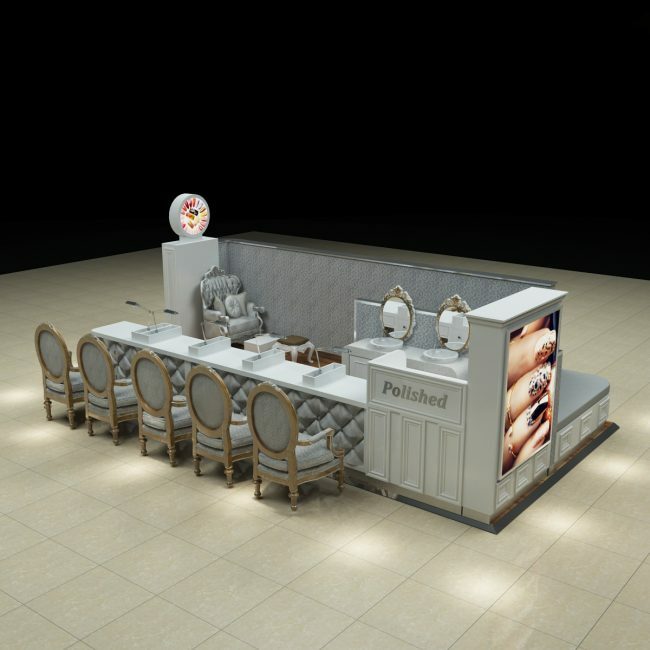 The nail kiosk have five luxury seats to be used to give customers a manicure, it has two more places to trim your toenails. The nail kiosk’s design very unique, the nail kiosk has a white nail table, it has a stereo, most of all, the nail kiosk has a rest area to let people break, very convenient, the nail kiosk looks very clean and tidy, the nail kiosk very attractive, believe if you take it to your shop, your business will be better. The nail kiosk’s detailed descriptions. Size: 5m by 2m, or customized accoreding to your shop size. The story of our nail bar kiosk. At the beginning, our nail kiosks’ shape is not that, a few month ago, a customer looked our nail kiosk, he like it very much, so he began to communicate with us, he made many suggestions about our nail bar kiosk, so we began to make a new design, after the customer saw the new design, he very satisfied the new design of our nail kiosk, then we began to make it, when we finished it, we sent it to the customer, he very like our nail kiosk. we hope you also can make your suggestions of our nail kiosk, we will also make a new nail bar kiosk according to your suggastions. you will have yourself story. About our nail bar kiosk. One, the quality of our nail kiosk very good, you don’t worry it. 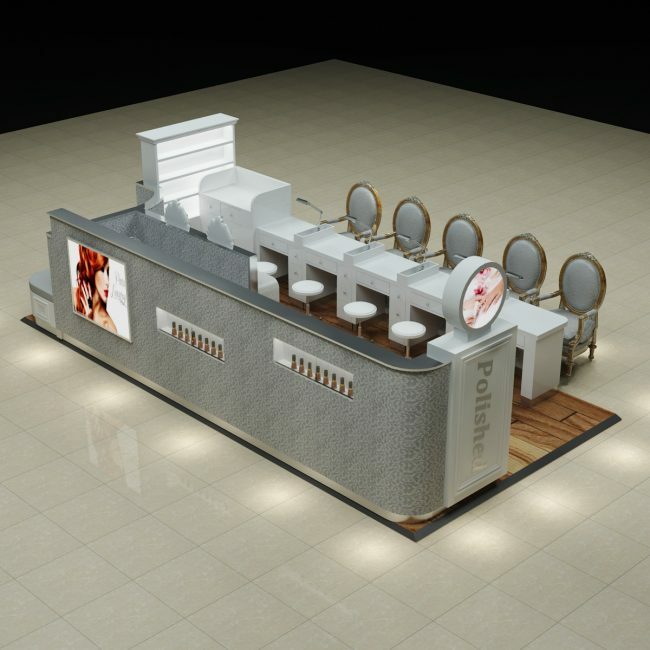 Two, our nail kiosks’ design very novel and high-end, its layout very perfect. 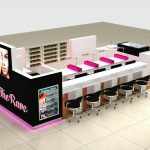 Three, we can according to your need to custom-made our nail bar kiosk. Four, Our people always keep their eyes on the order and we take pictures everyday so it is a daily record for your order. Five,If you want to know your order production details you can ask photos from our people and we work 24 hours for you. At last, the nail kiosk very popular, we have sold a lot of them and they are different in size and color, they are very satisfied, looking forward to your inquiry.